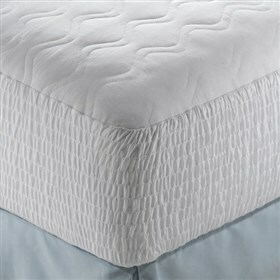 The Beautyrest Egyptian Cotton Mattress Protector adds comfort providing long lasting protection. This mattress pad boasts a 400 thread count cotton top that is teflon treated, with the added layer of loft created by the polyester fiber fill. The extra-deep Expand-A-Grip® skirt is designed to hold securely to any mattress up to 20” deep. The Beautyrest Egyptian Cotton Mattress Protector - Tw has many exciting features for users of all types. See the Beautyrest Egyptian Cotton Mattress Protector - Tw gallery images above for more product views. The Beautyrest Egyptian Cotton Mattress Protector - Tw is sold as a Brand New Unopened Item.